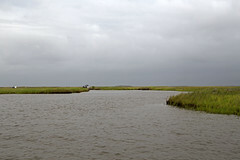 The landfall of Hurricane Katrina in southeast Louisiana destroyed thousands of acres of marsh and other coastal habitats in the Lake Pontchartrain basin. The hurricane weakened the Lake Pontchartrain shoreline and large areas of interior marsh habitat were either lost or damaged near Chef Menteur Pass. This area has an estimated erosion rate of 18 ft./yr. or greater. A portion of the lakeshore is protected by rock dikes (Bayou Chevee PO-22, State only project and FWS funded project). Shorelines that are not protected by rock dikes will erode back into the shallow open water areas located near the shorelines further increasing erosion rates. This project would extend the Bayou Chevee (PO-22) rock dike along approximately 33,324 LF of weakened Lake Pontchartrain shoreline. A 6,468 LF foreshore dike and a 13,851 LF revetment totaling 20,319 LF is proposed to be built along a portion of the Bayou Savauge NWR. This would protect approximately 201 acres. This project would also create/nourish 115 acres (100 acres of marsh creation and 15 acres of marsh nourisment). That marsh would be created by filling those sites with material hydraulically dredged from the bottom of Lake Pontchartrain. A combination of healthy established marshes, bayou ridges, and constructed earthen dikes would contain that material. All constructed containment dikes would be sufficiently gapped within 3 years to allow for exchange of nutrients and estuarine organisms. This project would work synergistically with other restoration projects in the area including CWPPRA, state, and Bayou Savauge National Wildlife Refuge projects. to wind generated waves along 33,324 linear feet of the Lake Pontchartrain shoreline, preserving 201 acres (166 acres of marsh and 35 acres of shallow water) and 2) create/nourish 115 acres (create 100 acres of marsh and nourish 15 acres of marsh) landward of that shoreline protection. Service goals include the protection/creation of habitat or improvement of habitat for species of concern (LDWF), priority species (JV), and threatened and endangered species (FWS). The creation of low salinity brackish intertidal marsh habitat would be beneficial to several species that are currently on these lists, including, but not limited to Black Rail, Mottled Duck, Brown Pelican, King Rail, and Saltwater Topminnow. Helping to improve habitat, especially on Federal and State owned lands, ensures the protection of those valuable resources in perpetuity and should be a priority. This project is located in Region 1, Pontchartrain Basin, Orleans Parish. This project was approved for Phase I Engineering and Design in January 2017 and is on Priority Project List (PPL) 26.